?Real Madrid have officially unveiled new signing Brahim Diaz following the teenage midfielder’s €17m move, rising to a potential €24.5m, from Premier League champions Manchester City. Brahim, who ventured to England after initially starting his career in the youth ranks at home town club Malaga, underwent a successful medical in Madrid earlier on Monday. 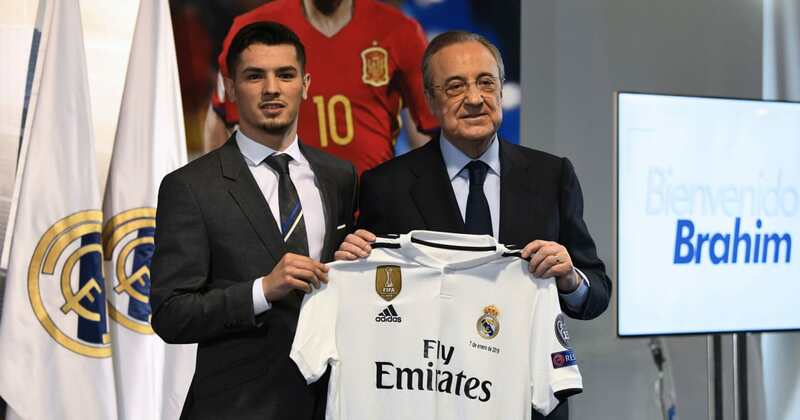 The 19-year-old stood alongside president Florentino Perez holding his new number 21 shirt, last worn at ?Real by academy graduate Borja Mayoral prior to his loan to Levante this season. Brahim subsequently ventured down to the Bernabeu pitch in full kit to perform the usual ball juggling tricks in front of a large ‘Bienvenido’ sign for the gathered fans and photographers. Brahim made his bow in professional football shortly after his 17th birthday in 2016 when he played for ?Manchester City in an early round of the EFL Cup against Swansea. He subsequently played 10 times for City in all competitions last season and scored twice in his four appearances at first team level during this first half of this season. Manager Pep Guardiola had recently insisted that City were keen for Brahim to stay, with only his expiring contract and desire to join Real leading him to leave Manchester in the end.